Diwali is coming in this month 30th October so all the online retailers started Diwali special festival sales. 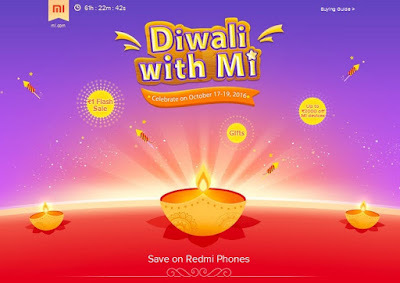 After the festival sales of the main retailers such as Amazon, Flipkart and Snapdeal, now Xiaomi also announced “Diwali with MI” festival with special discounts and 1 Rs. Flash sale on its official site. The company offers three day shopping festival starting from October 17 to October 19. Xiaomi offers discounts ranging from Rs.500 to Rs.3000 on MI phones, Redmi Phones and other accessories. The company also will launch the new devices that it announced in India recently. The new devices are MI Air Purifier 2, MI Band 2, MI Max Prime and MI Power Bank Pro will be available to buy from MI official site on these days. MI Max Prime higher version phone will be launched for Rs.1999 this Diwali sale that was announced in June month. The phone is powered by Snapdragon 652 processor, 4 GB RAM and 128 GB Storage. And also recently launched MI 10000 mAh Power Bank Pro also available on this season for Rs.1999. Xiaomi offers flash sales on selected device on these 3 days on 2 PM and you need to to register on the official site. October 17 – 30 units of Redmi 3S Prime smartphones and 100 MI Bluetooth speakers will be available in Re 1 flash sale. October 18 – 30 units of Redmi Note smartphones and 100 units of 20000 mAh Power banks will be available for Re 1 flash sale. October 19 – 30 units of MI 4 smartphones and 100 MI Band 2 will be available for Re 1 diwali flash sale.